Adiperukku during July-August is the famous festival of the temple. Sri Mahalakshmi Temple, Krishnarayapuram, Mahadanapuram-639 106, Karur district. The temple was built by Krishnadevaraya 1000 years back. There are three corridors – Prakaras to go round the temple. Devotees pray to Mother Mahalakshmi for removal of obstacles in marriage alliances and for child boon and achievements in education. Devotees tonsure their hair and break the coconuts on their heads on the Adiperukku festival day. The reputation of the Mahalakshmi temple in Krishnarayapuram-Mettur Mahadanapuram is the strange manner of the devotees tonsuring and breaking the coconuts on their shaven heads. The tradition continues even now. A King by name Sivaperuman was ruling the Perumizhalai region. Kurumba Nayanar one of the 63 Nayanars was in his services. Kurumba Nayanar had Sundaramurthy Nayanar as his Guru and was greatly respected by the people for his devotion to Lord Shiva. He was so named after his community and was born onChithirai star day in the month of Aadi (July August). He used to take sufficient food and other essentials packed in a woolen cloth and dispatch it from the border of the place. The Kurumbas were grazing sheep. The woolen fabric was made from the hairs of the sheep. Nayanar was simple in nature and was noted for austerity by all. He held Lord Shiva in his heart and led a life dedicated to the Lord. As he was ever chanting the hymns of Sundarar, the Tiruthonda Pathikam in particular – the 10 verses in praise of all the Nayanmars at the Tiruvarur Temple, Kurumbanayanar attained the great powers mentioned in our scriptures as Ashtamasiddhis. He was also ever chanting the Five Lettered Mantra called Panchakshara – Na Ma Si Va Ya. When Kurumba Nayanar came to know that Lord Shiva decided to recall Sundaramurthy Nayanar, his Guru to Kailash, Kurumba Nayanar decided to reach Kailash before his Guru with the help of Yogas as he could not live on earth in the absence of the Guru. This episode is described in the great Tamil Epic Periapuranam. 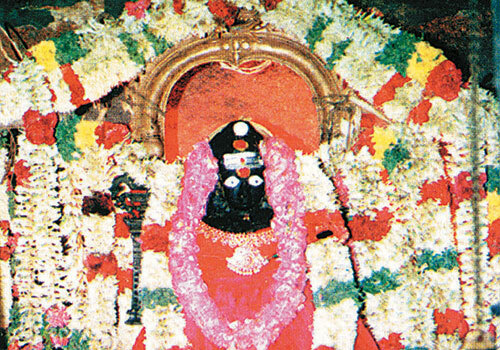 Sri Aadi Mahalakshmi was the family deity of Kurumba Nayanar. Sri Mahalashmi came into being when the milk ocean was churned by the Devas and the Demons. Lord Vishnu was distributing the Nectar to the Devas and the poison (both came from the milk ocean) to the demons. As demon Andhakasura was slipping away from the place to avoid the poison, he saw Mahalakshmi and was tempted to get Her. When Mahalakshmi ran away from him, he chased her up to Mettur Mahadanapuram where the Kurumbas were grazing their cattle. Mother Mahalakshmi hid Herself in a hole. Incidentally, Ravana was performing penance there. On seeing Mahalakshmi, Ravana was afraid that She had come there to kill him and immediately left for Lanka. Andhakasura chose the Ravana’s place for hiding. Mahalakshmi was consuming the milk of the sheep which the Kurumbas noticed with surprise. They dig a wet place and found Mahalakshmi as a Swayambu. She begged the people to protect Her from the Demon to test their devotion which people also understood. They covered the Goddess in the woolen cloth. But the demon fought with them and also caught Lakshmi. People prayed to Lord Shiva but He did not listen to their prayers and did not turn up. As the three-eyed Shiva did not turn up, the devotees chose the coconut also having three eyes as Shiva and began to break it on their heads. Pleased with their determined devotion, Lord Shiva appeared and protected Mahalakshmi. 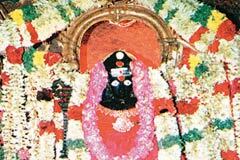 The temple is situated in Mahadanapuram-Krishnarayapuram in Karur district. Bus facilities are conveniently available from Karur.